Speed and making the right decisions are the keys to success. Speed, action, and results—Martin Limbeck embodies these like no other. As keynote speaker for sales and motivation he takes on some controversial issues and offers his participants valuable and practical insight. 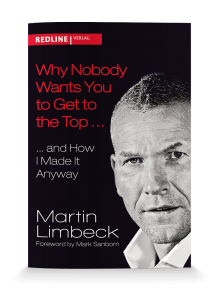 Martin Limbeck is never mainstream, always speaks to the point, is dynamic, candid, and uses his considerable power to keep his audience enthralled. For more than 25 years he has galvanized management and sales employees using his insider know-how and concrete strategies. To date he has performed in 22 countries; his books have been translated into several languages. He is one of the few to have made it into the American market both as a speaker and as an author: Following the publication of “NO Is Short for Next Opportunity: How Top Sales Professionals Think,” his second book “Why Nobody Wants You to Get to the Top… and How I Made it Anyway” was released in the U.S.A. in November 2015. Both in his provocative and motivational presentations and in his implementation-oriented training, it is the notion of progressive selling as a whole that takes center stage. This has made him one of the most effective and powerful keynote speakers, not only in the sales arena but also in matters of motivation. Martin stands for closing-oriented selling on an equal footing. He focuses on the personality of the sales professional and demonstrates that success is mindset—especially in sales. He shows the participants how to get past the gatekeeper and directly to the top decision maker and how to conduct your sales pitch at the highest decision-making levels. In his view, sales invariably involves relationship management. The participants discover how to stay ahead of the pack amidst fierce competition, tight markets, and a vast array of comparable products and services on offer. These are a given with keynote speaker Martin Limbeck. His original and effective implementation strategies work in all phases of the selling process and represent the ultimate path to outstanding sales performance. Martin Limbeck has his share of rough edges. And he is among the few keynote speakers who in the area of sales and motivation actually practice what they preach.